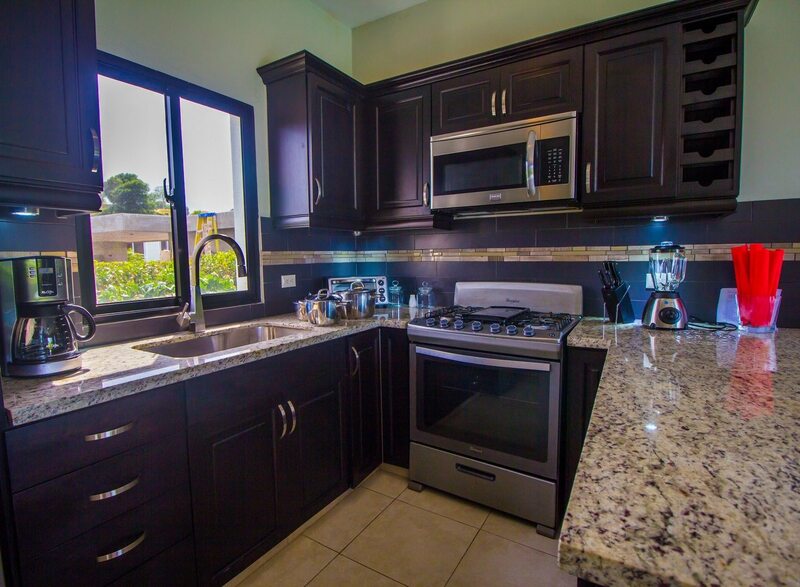 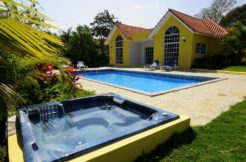 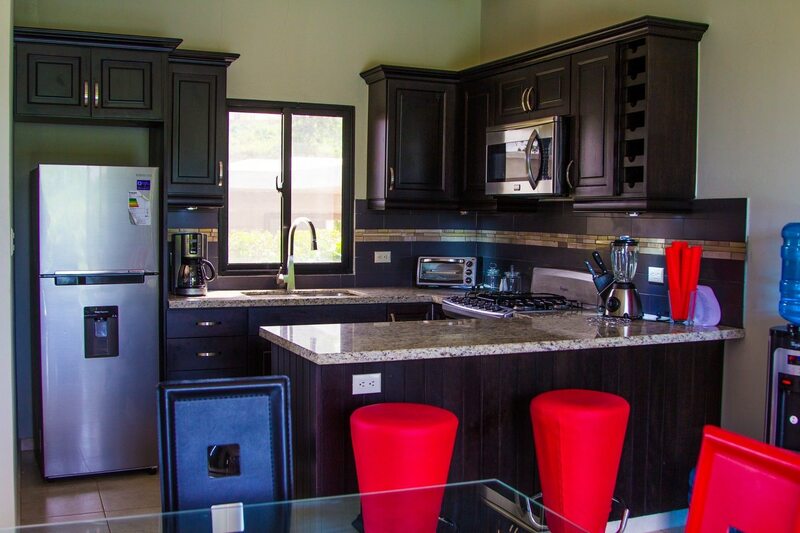 Sosua travel villa rental 2 bedrooms Dominican Republic, for 2 couples. 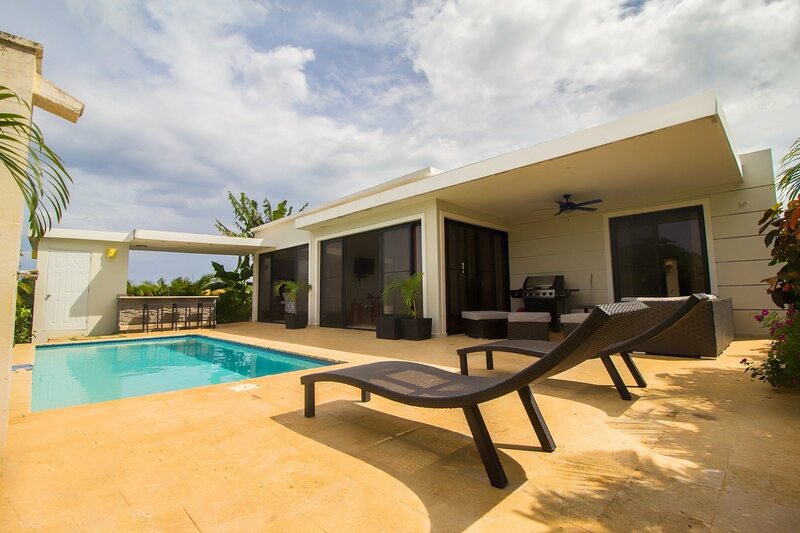 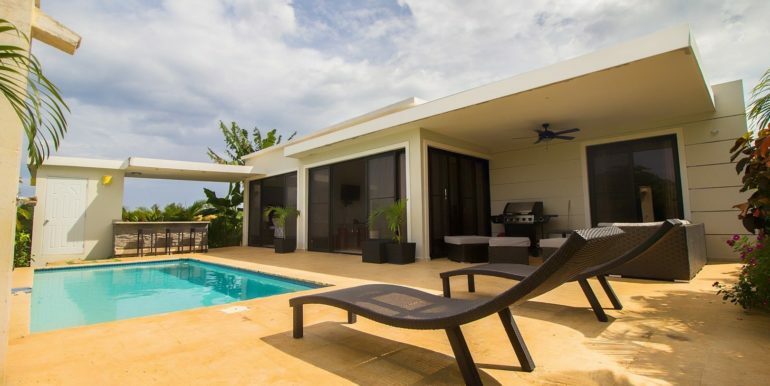 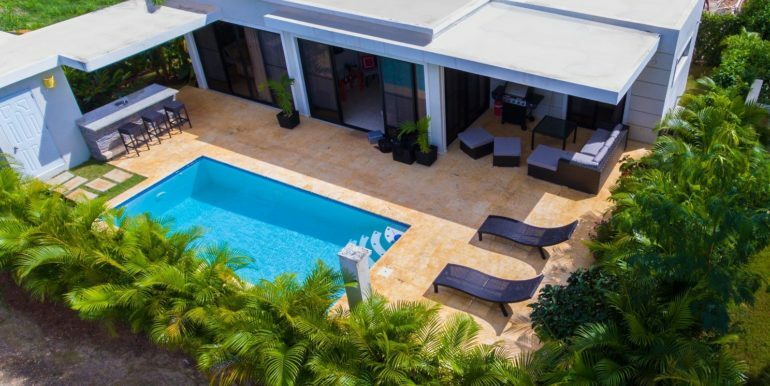 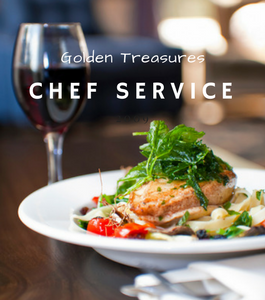 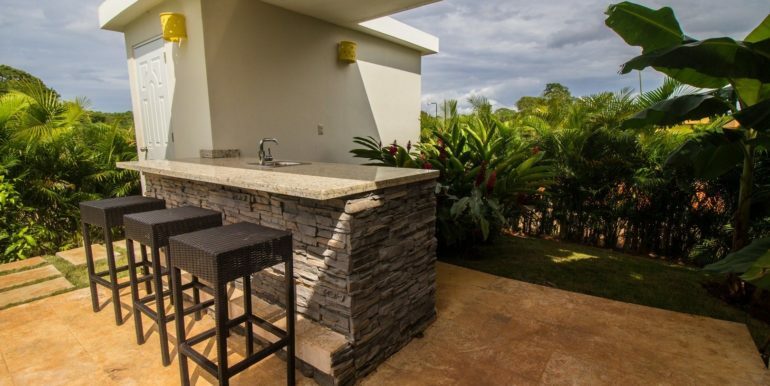 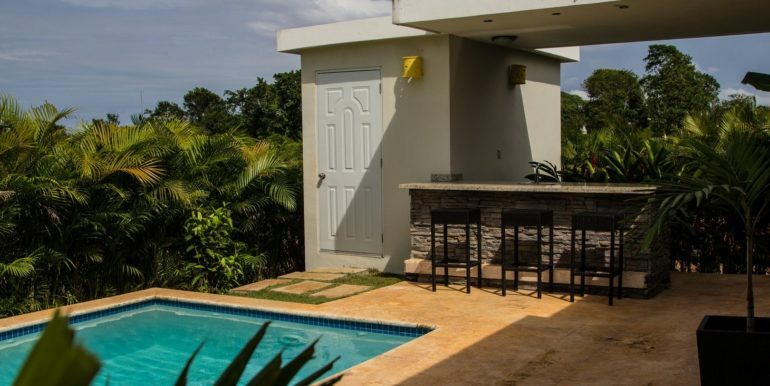 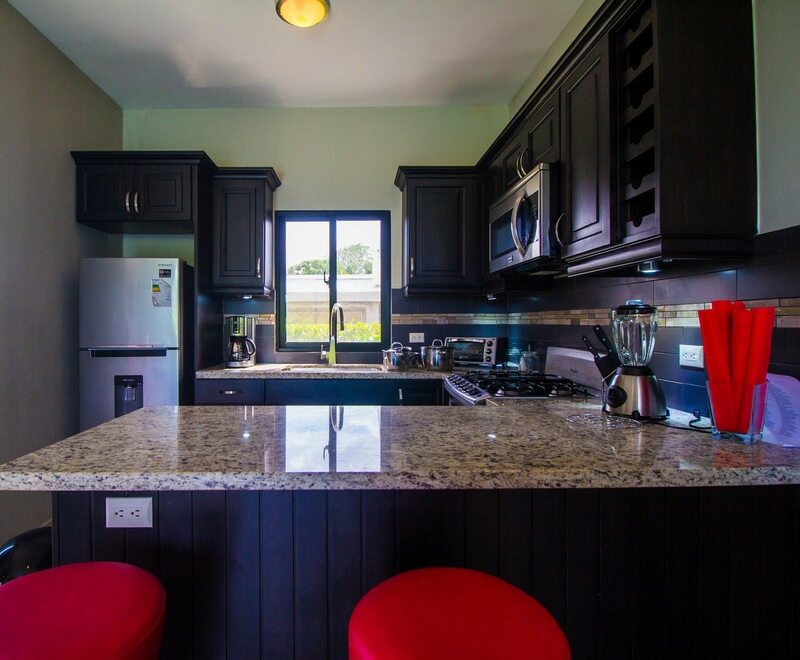 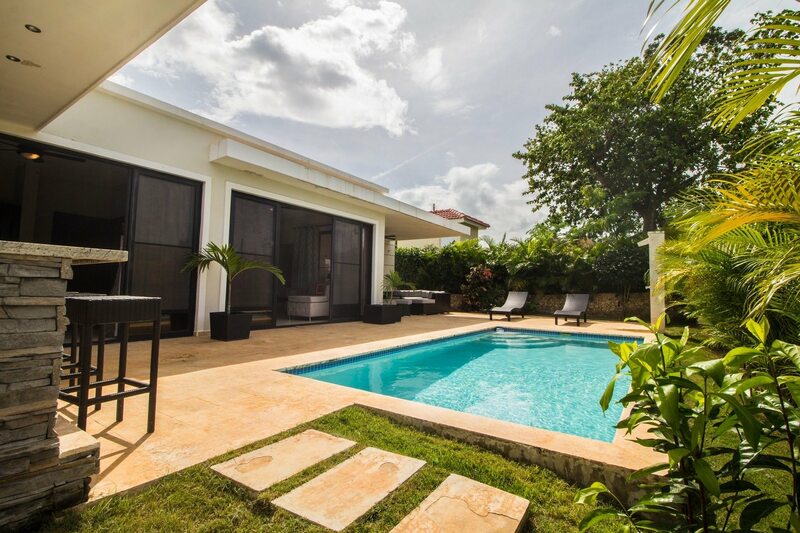 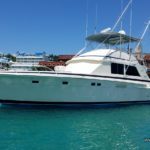 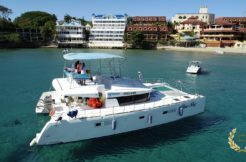 Traveling to Sosua offers a lot of options in regards to lodging, and villa rentals have taken a special place in the travel planning agenda for many that visit town to relax, do business and visit friends. 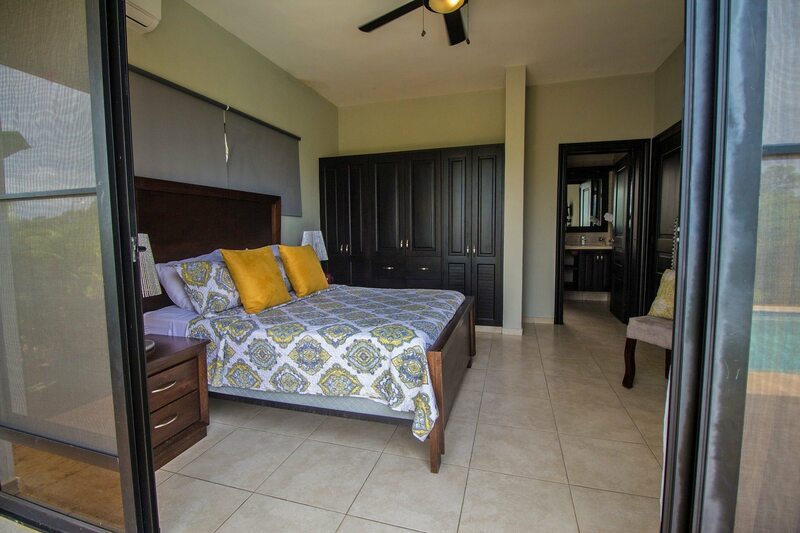 This 2 bedroom villa packs a complete set of amenities for self-catering at affordable rates if the traveling group is no more than 4 people. 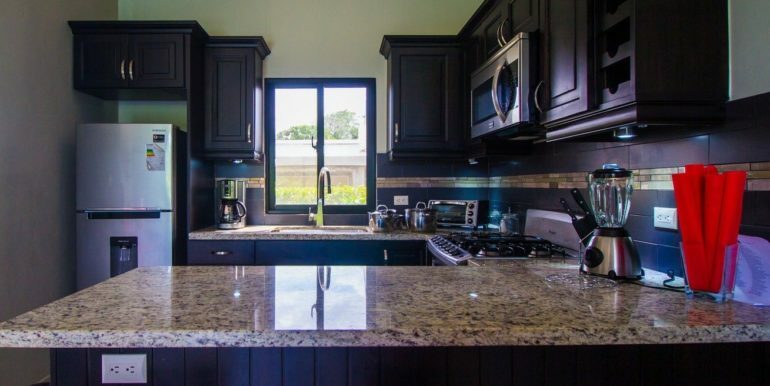 Built on one floor, in a bold, modern style that distributes the layout efficiently for its guests, so the living room incorporates an open-design kitchen with breakfast nook, built of darkened wood and granite tops; Just the right size for a chef at heart to entertain its guests without losing conversation. 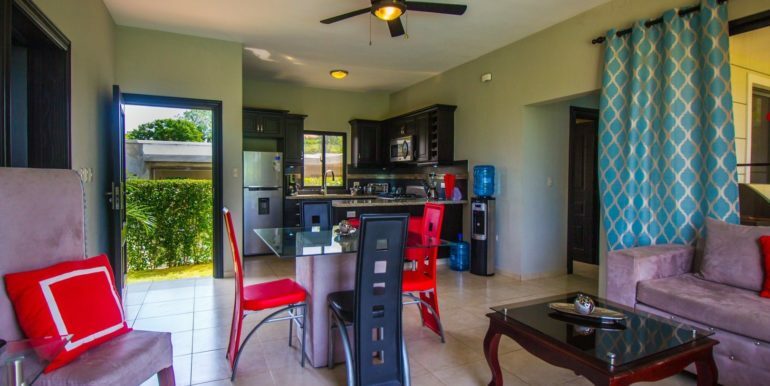 The dining table sits between the living room sofas and the kitchen, following the Ying/Yang bicolor combination we featured on a previous listing ( this one is red and black ). 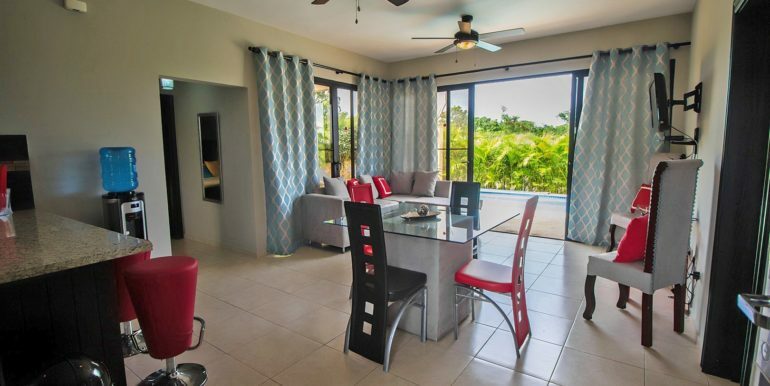 The table a glass top square with upholstered base matching the sofa`s light gray suede color. 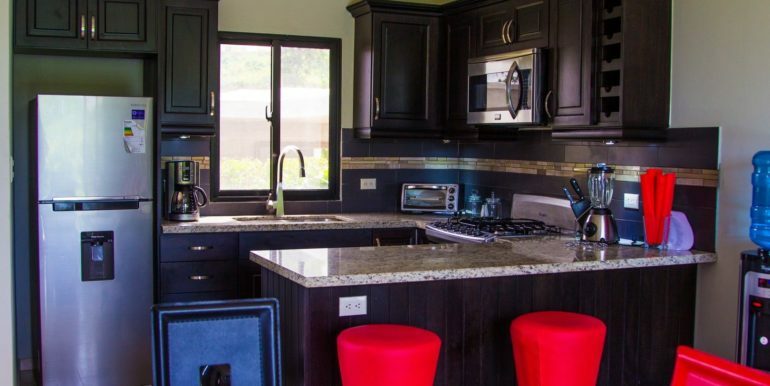 Two high-backed chairs of the same color flank the media area with TV and mantel table. 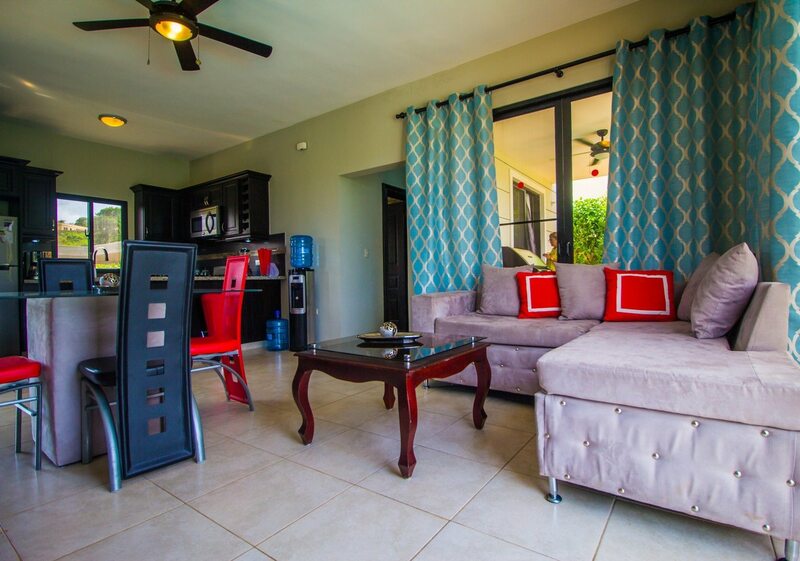 A suspended glass wooden coffee table is placed right next to the L-shaped sofa for the guests to enjoy. 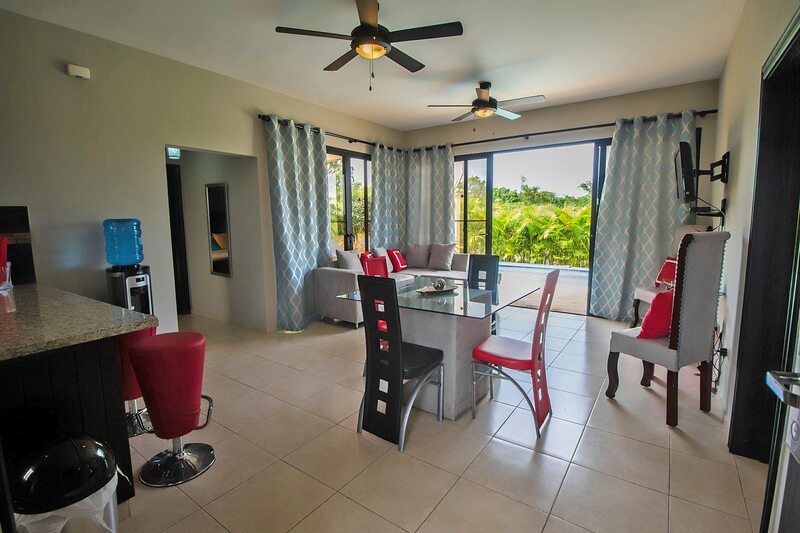 The villa décor implements neutral gray tones with bright accents in red and black, including the curtains and walls. 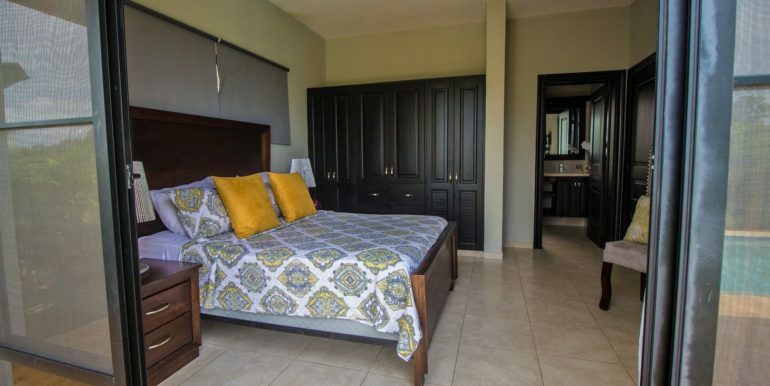 Its bedrooms are richly decorated too, and the master suite is second to none with its fine bed set contrasting against the olive wall paint and blue/gray curtain drapes. 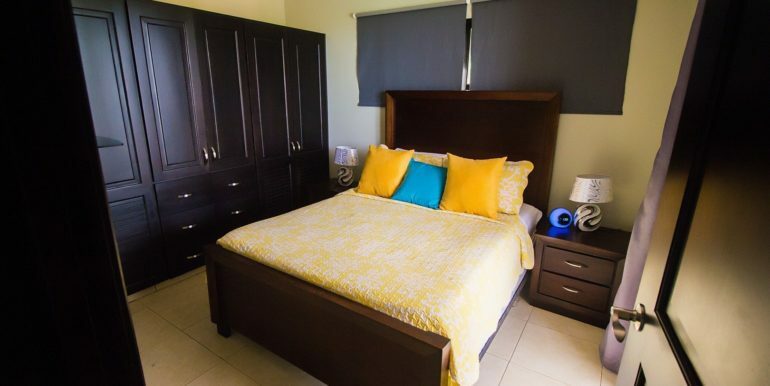 Warm sun light bathes the bed and its yellow cushions very nicely at sundown, almost picture perfect. 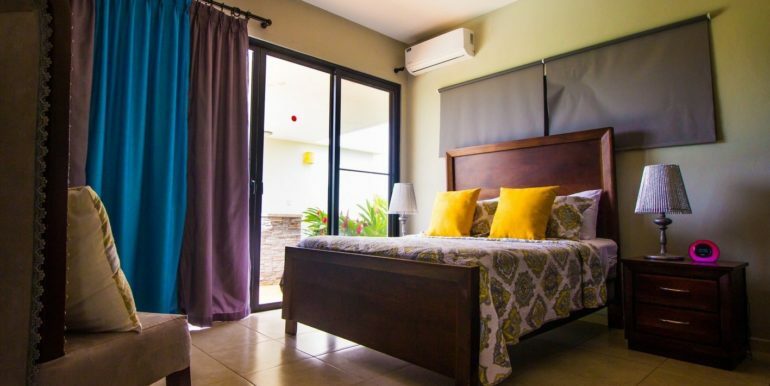 The bedrooms in the villa all include rental essentials so guests can enjoy worry-free: air conditioning, ceiling fans, linens, towels, TV….just what every guest needs for a truly nice vacation in Sosua. 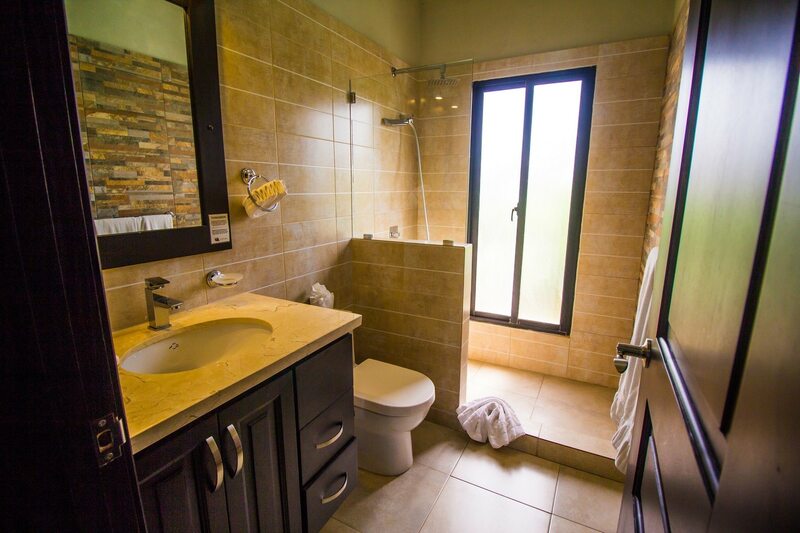 The bathrooms also show refinement in design, with dark wood cabinets, 2-meter ceramic walls and embedded lighting. 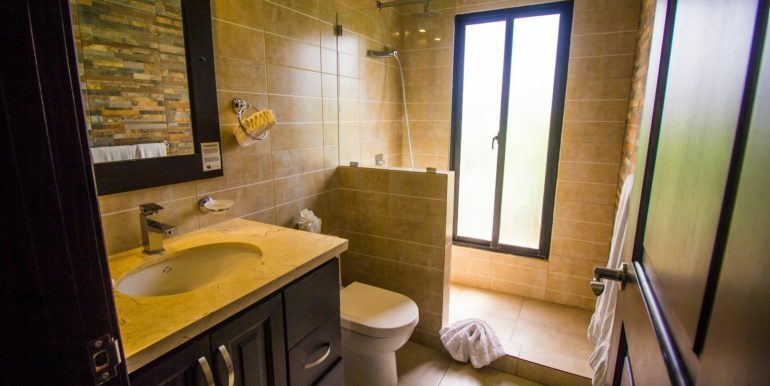 The WC sets are all imported, with secure lids ( the type that auto closes quietly ). 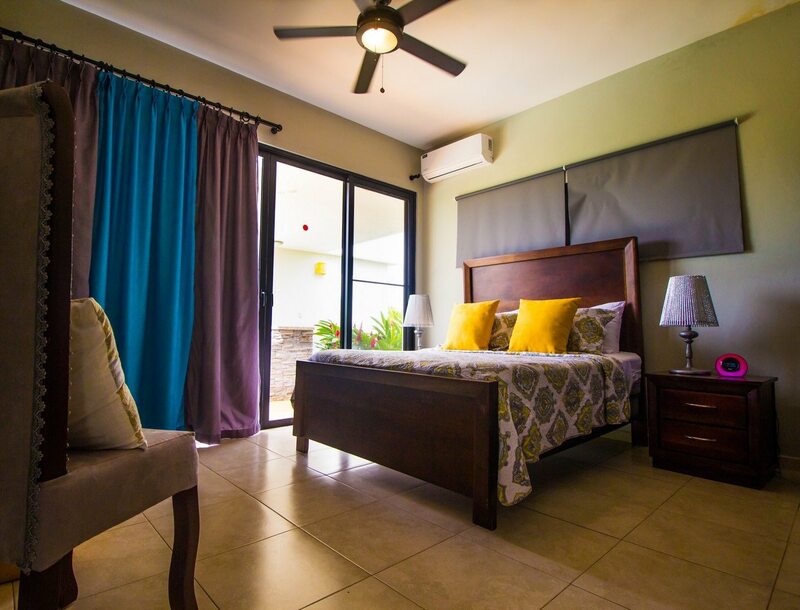 The second bedroom also sports fine bed set ( wooden bed back and side tables ), golden yellow covers and rolling shutters in the windows. 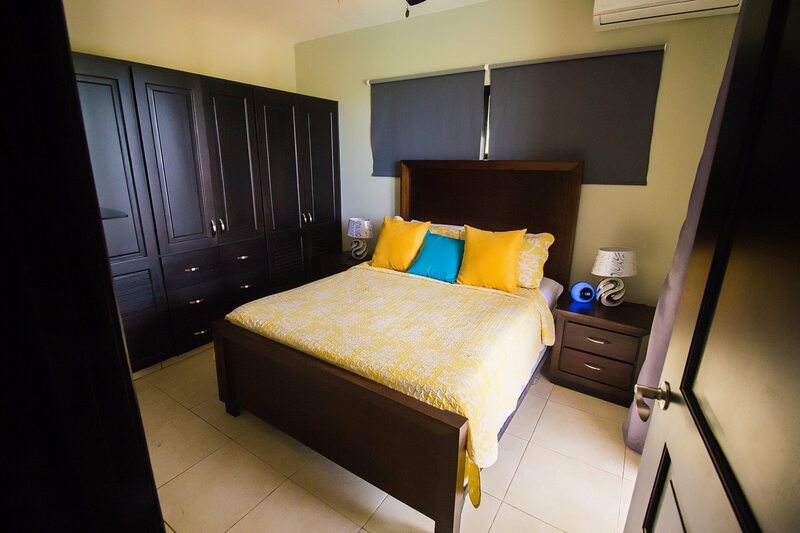 Contrasting yellow against wood, gray and olive creates a relaxing atmosphere out of some interior design magazine such as Elle Decor. 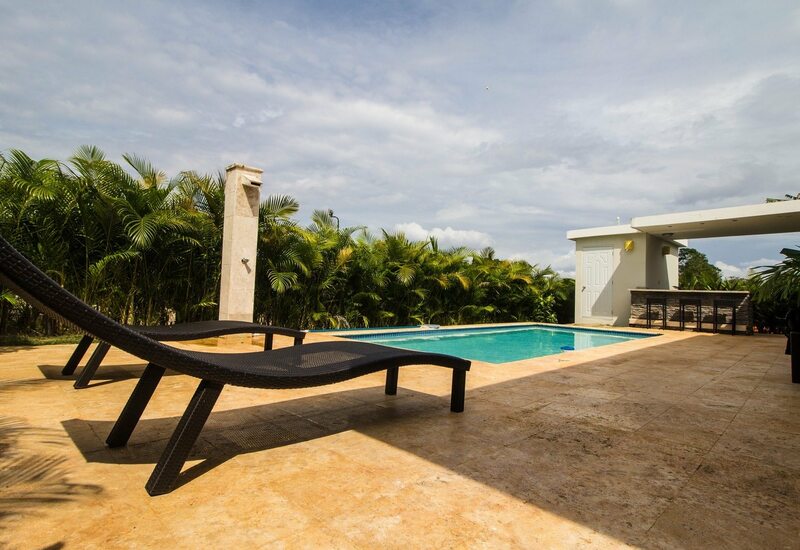 Outside, the blue sky sets the tone in the morning, to stretch by the swimming pool, grab a book and sprawl in the chaise lounge. 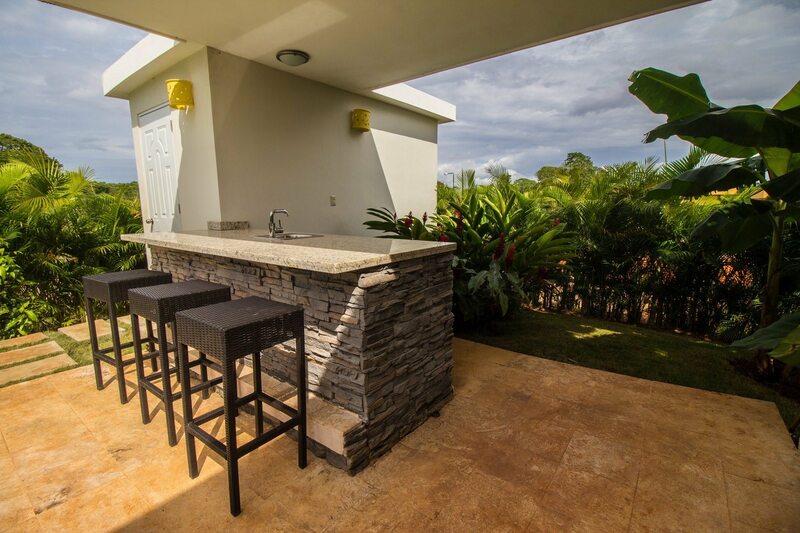 The outdoor BBQ/kitchen area includes stools and a roof, for small party moments among friends and guests. 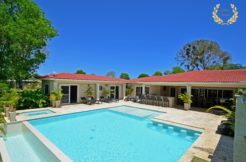 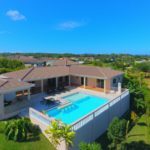 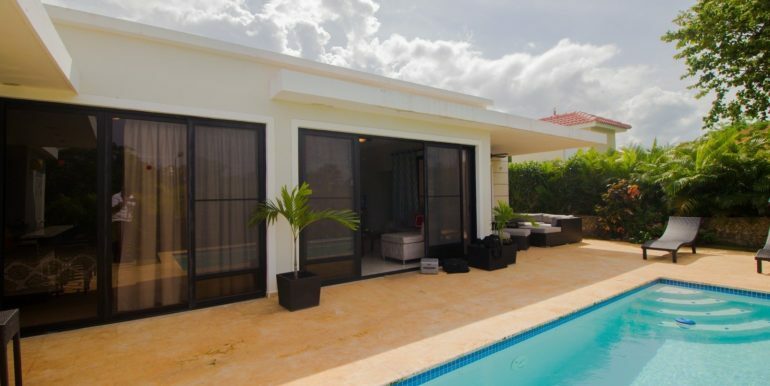 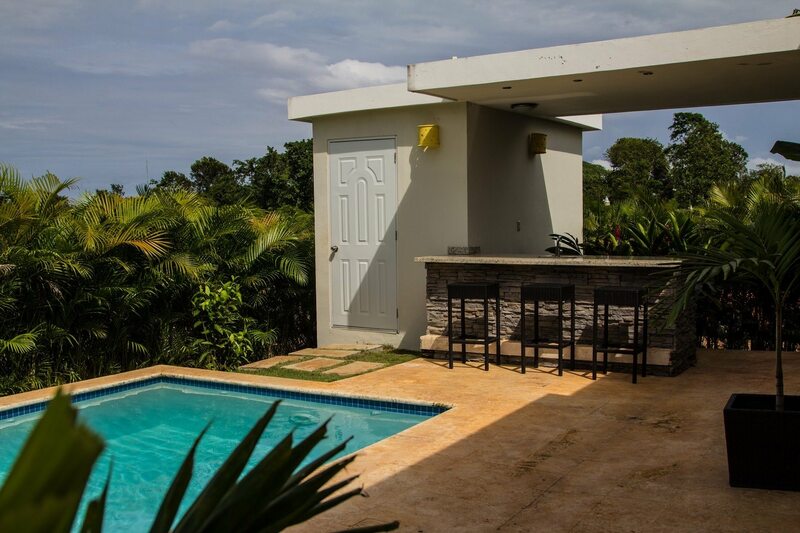 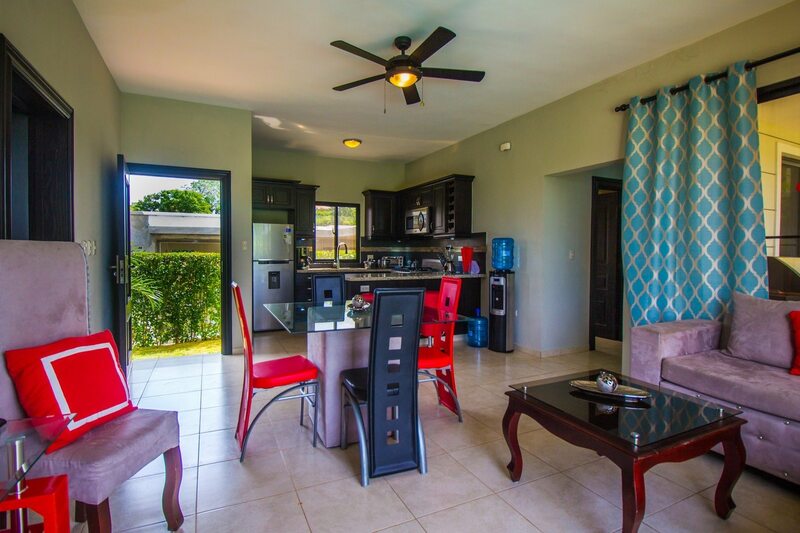 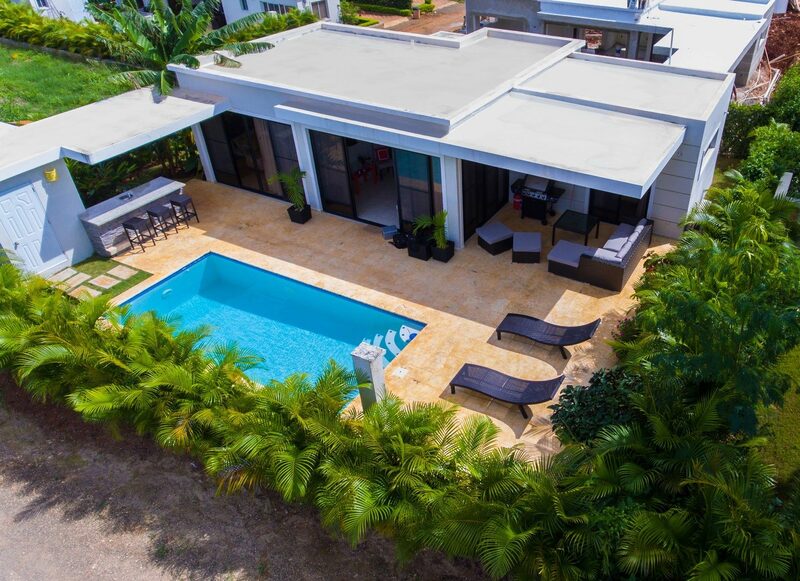 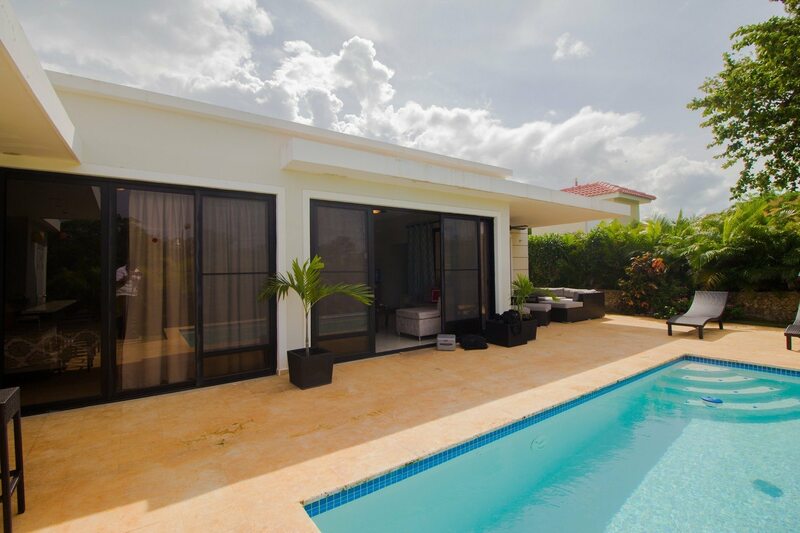 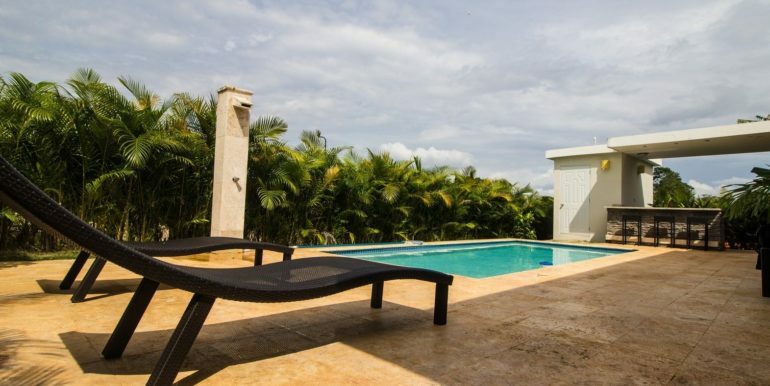 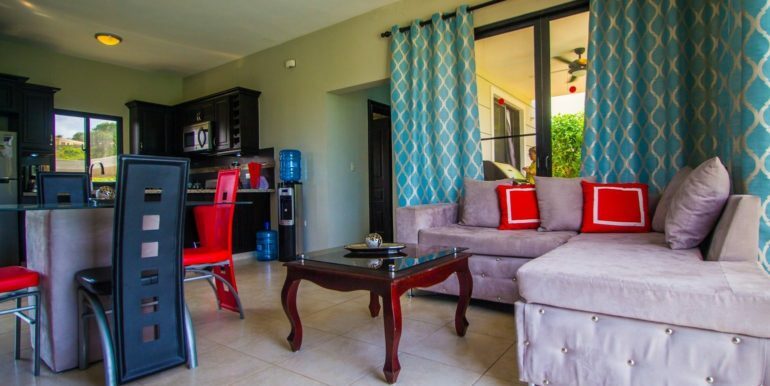 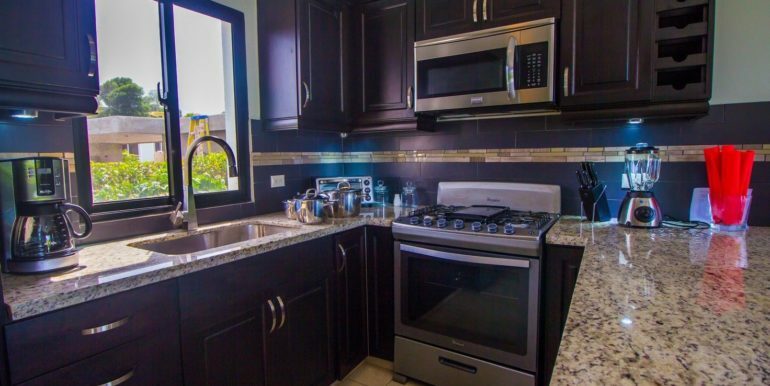 Sosua villas like these are really affordable, kept in excellent condition and located just a 4 minute drive to the heart of town, including Sosua Beach and its main shopping centers. 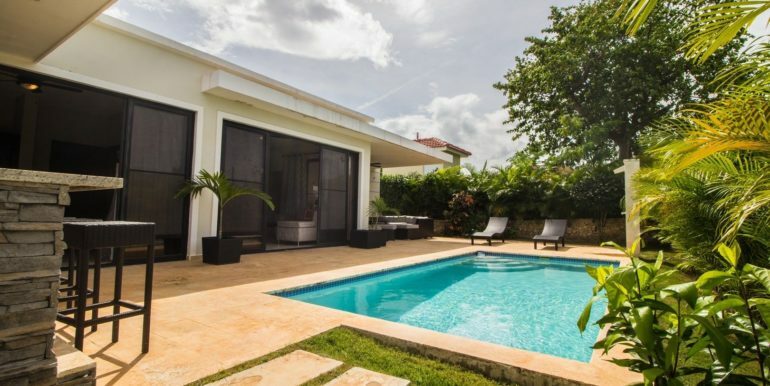 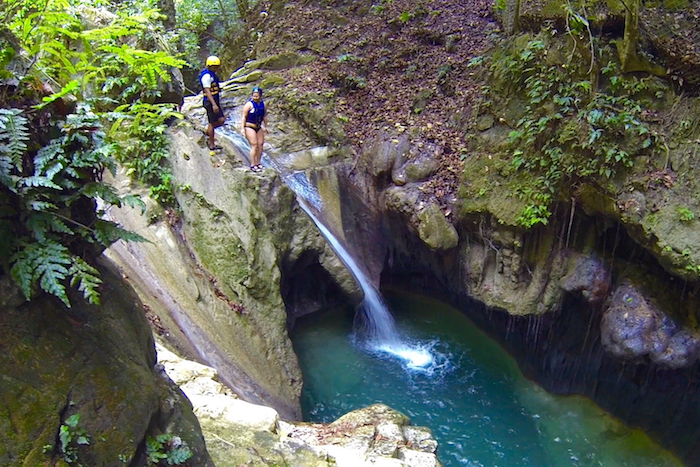 The closest airport to fly to is POP in Puerto Plata, just a 15 minute drive.